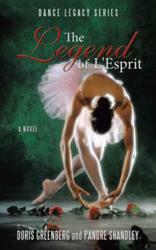 Encouraged by students who were eager for a novel entwined in the world of dance, instructors turned novelists Doris Greenberg and Pandré Shandley present the first title in their “Dance Legacy Series,” “The Legend of L'Esprit: Dance Legacy Series” (published by AuthorHouse). While innocently pursuing her passion, unearthly events torment L’Esprit’s newest dance student, Libby Nobleton. Lights flicker, eerie shadows glide, and the open door of the abandoned elevator menacingly beckons. Libby struggles between her love for her studio and the fear that someone – or something – might be out to get her. Led through time by L’Esprit’s legendary statue resembling a prima ballerina of the past, Libby exposes the shocking yet inspirational truth about the prima and L’Esprit’s most tragic night. But who will believe her? Although written from their hearts as dance teachers and geared toward young adults, the universal theme of love and forgiveness appeals to non-dancers and readers of any age. “Our book uniquely relates to the dance community, but readers with no dance background enjoy its mystery and adventure,” says Greenberg and Shandley. Doris Greenberg resides in the Milwaukee area where she is blessed to be a wife, mother and proud grandmother of five. She discovered her passion for dance at the age of four, and her training led to a 21 year career as a professional ballet and tap teacher instructing students ranging from very young children to senior citizens. She successfully directed a community dance program, currently choreographs several local elementary schools’ annual spring productions, and mentors third grade writer workshops. She and Pandré Shandley created Dancers at Heart LLC, a project which united them in their shared love of writing and dance. Pandré Shandley is also a Milwaukee native and holds a bachelor’s degree in business from the University of Wisconsin-Eau Claire, where she also trained and performed as a dancer. She’s married with two children. After leaving a career in marketing and finance, Shandley followed her dream and joined a local dance studio. As a teacher for 20 years of ballet, tap, jazz, lyrical, and hip hop, she and her students participated in numerous workshops, conventions and competitions. She was instrumental in creating their studio’s award-winning Troupe Program and was proud to oversee the assistant teaching staff. Both authors are excited to share The Dance Legacy Series and strongly believe in the healing power of words and the gift of dance.